Series BPC and Series BPC-R Bellows Pump Connectors are an ideal solution when a flexible pipe connector is required in severe service applications. Often, an application will require a connector to isolate noise and vibration, relieve stresses on equipment, and handle both high temperatures and axial motion. Rubber connectors will have relatively low pressure ratings at high temperatures. Braided connectors can offer high pressure/high temperature capabilities, but do not of fer any axial movement capabilities. Pressure ratings of bellows pump connectors are virtually unaffected by high system temperatures and these special connectors are able to absorb limited amounts of axial travel and lateral offset. The special design of Series BPC and Series BPC-R connectors includes multi-ply stainless steel bellows to provide long life and isolation in high-frequency applications. 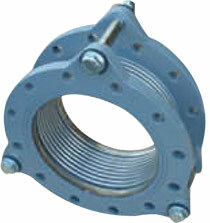 Three built-on tie rods prevent over-extension in high pressures and eliminate jobsite installation of rod assemblies. Special rubber grommets are installed on each end of rods so that noise and vibration is not transmitted across the steel rods. Series BPC bellows pump connectors are our standard overall length connector designed to provide .” compression and 1/8” lateral motion, plus pump vibration. Series BPC-R connectors are constructed in overall lengths to match standard single rubber connectors. BPC-R connectors will provide about 1” compression, 3/8” extension and from 1/8” to 5/16” lateral motion, plus pump vibration. Sizes larger than 12” available upon request.